Gellert Spa & Thermal Baths is located on the Buda side of Budapest, just by the river Danube, at the foot of Gellert Hill and the Liberty Bridge (Szabadsag hid). It’s relatively close to the city center (15 min by public transport). 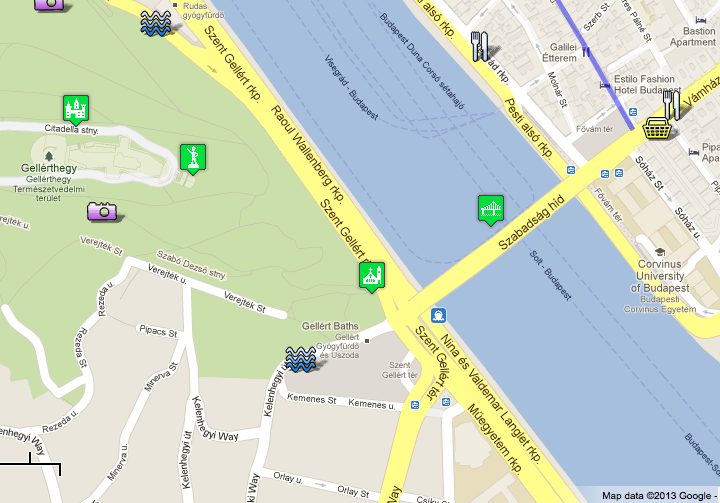 See where Gellert Spa Baths is located in Budapest at the bottom, on Budapest tourist map. 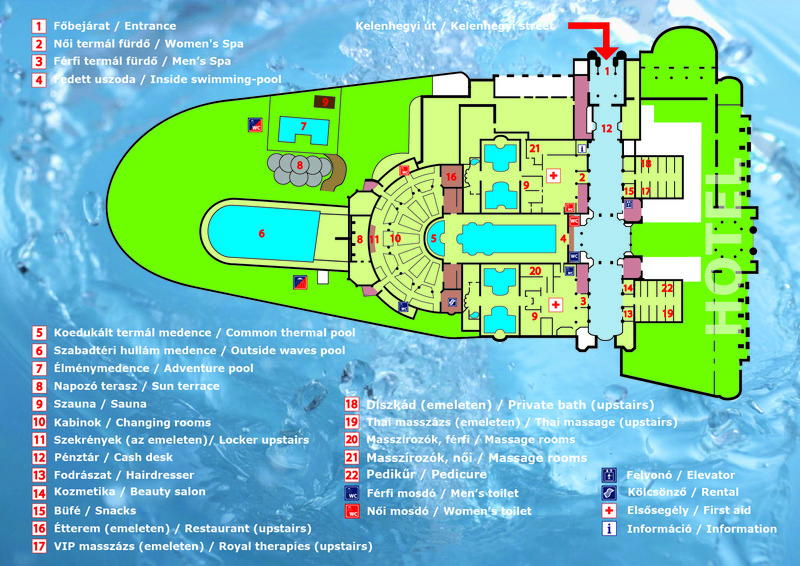 Gellert Spa is one of the biggest natural spring water bath complexes in Central Eastern Europe, with several pools, saunas, steam rooms, massage rooms, changing facilities (cabins, lockers), restaurant, and more. Picture a big palace with a Roman style swimming pool, Art Nouveau thermal chambers filled with hot spring waters and steams, many corridors, and you will feel being in an artsy labyrinth. The gem of Budapest Baths. And since Jan 1, 2013 all its pools and facilities are open to both men and women (co-ed). First time visitors in Gellert Spa Bath, especially tourists, find themselves in a big building where it is easy to get lost. We recommend spa guests, bathers & the hotel guests in Danubius Hotel Gellert to save the map of Gellert Spa on their smart phone, or simply print out the map to save some uncomfortable moments. Luckily the building is symmetric, so after the first visit, it is a lot more simple to find your ways. We often hear complaints from tourists that the wall boards and notices are not informative enough. 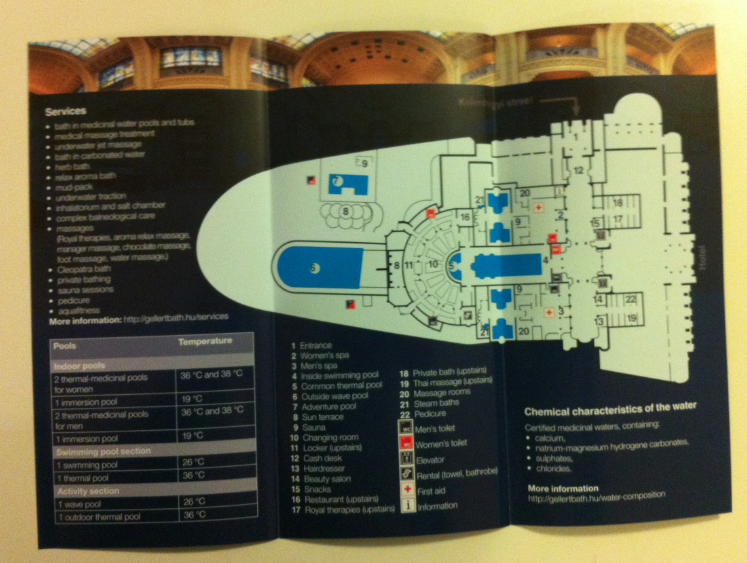 Now here is a comfortable pocket map for Gellert Spa Baths! Hopefully, it will help you not to get lost or feel frustrated when communicating with the bath staff is not smooth enough. 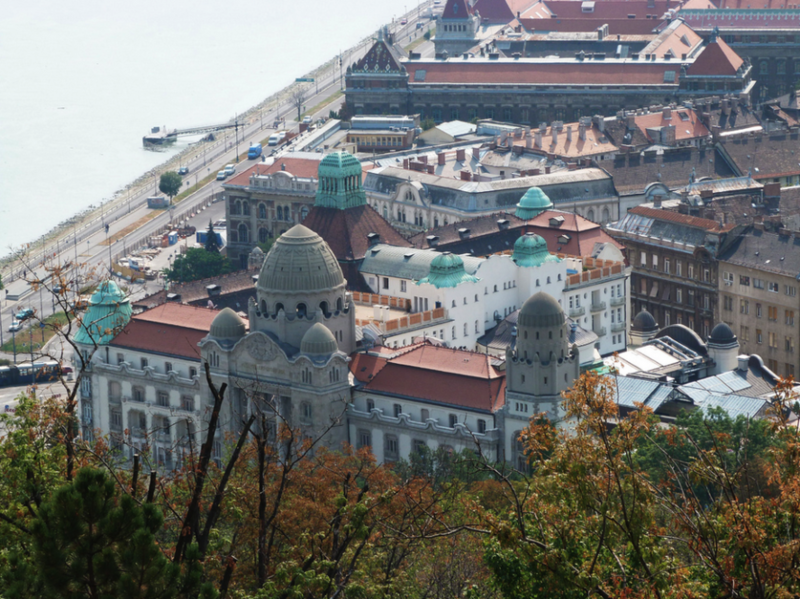 Gellert Spa & Thermal Baths is near the river Danube, at the foot of the scenic Gellert Hill. There are many top Budapest attractions nearby Gellert Spa, including the Citadel, the Cave Church (one of the hidden gems in Budapest), the Great Market Hall on the other side of Liberty Bridge, and further thermal baths in Budapest, like the popular Budapest Turkish bath called Rudas Bath. As the spa does not have any car park, I would suggest to go by public transport. The spa is relatively close to the city center (15 min by public transport). The closest car park is at 10. Kemenes street. Please, show your parking ticket in the spa for the discounted parking prices. except I know I am getting knowledge all the time by reading thes good posts. I saw in http://www.gellertbath.hu that you have Rosemary wonder.. but i can’t find it on the selected package. Do you have 2 website? is it the same one? Please advise on how to book the entrance +cabin + 45 mnts rosemary wonder on 9th February at 17h. The Rosemary Wonder is a type of the Harmony Aroma Massage (3 aromas can be selected from on the spot: Rosemary, Orange or Elderflower). Would be interested in biking massage for two people sometime after 1/30 pm today. Is there any availability? There are available massage appointments left for todmorrow, if you are interested.